The Cobalt® 9911DA-8-BPX Dual-Input 3G/HD/SD-SDI / ASI 1x8 Distribution Amplifier and Bypass Protection Switch with Passive Relay Protected Output provides 1x8 distribution of 3G/HD/ SD-SDI and ASI signals with a passive relay path to provide a failover output in case of loss of power. All outputs are non-inverting and usable for ASI. 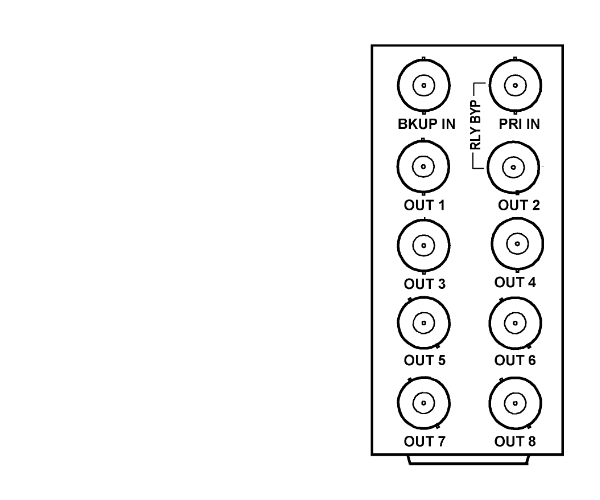 Either of two inputs can be routed to the eight card DA outputs. Inputs are equalized and reclocked. A Primary input is power-loss relay protected. A Backup secondary input can feed the DA outputs should signal absence be detected on the primary input. SNMP support can propagate notice if secondary input failover has been invoked. Excellent receive performance allows receive EQ for up to 120m 3G and 160m HD cable length (1694A). Card edge and DashBoard™ remote status monitoring indicates input lock for each input channel. Up to 10 of the 9911DA-8-BPX cards can be installed in a frame. Simple relay routing signal path maintains full signal integrity. Rear-module located bypass relay maintains signal path even if card/power is lost. SNMP support propagates notice if secondary input failover has been invoked. RM20-9911DA-A 20-Slot Frame Rear I/O Module (Standard Width) (2) 3G/HD/SD-SDI / ASI Input BNCs, (8) 3G/HD/SD-SDI / ASI Output BNCs. Relay bypass for PRI IN – OUT 2 path. You are currently requesting a quote for 9911DA-8-BPX.